At Search Marketing Summit Sydney today, Gary Illyes confirmed that page speed will be a factor in the next mobile friendly update. Google has long talked about wanting to make page speed a mobile friendly factor, but this is the first time someone from Google has confirmed that it is actually coming. I also asked Illyes when this would be coming, and he first said he didn’t want to give a date, which is understandable. But when I asked if we could expect it on months or years, he said that he w0uld expect to see it within “months”. 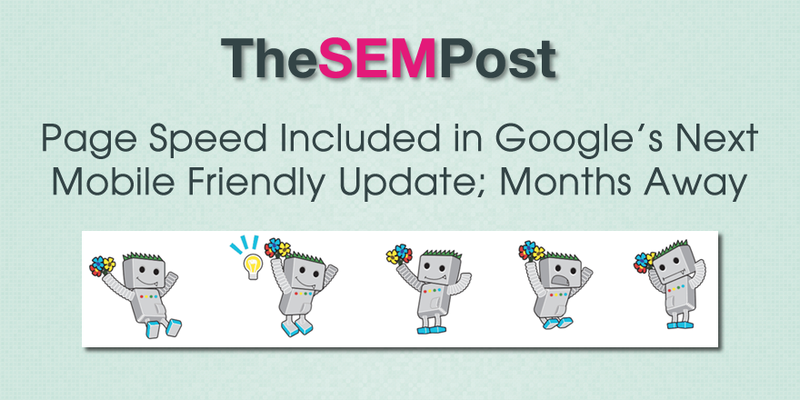 It was over a year ago when Google’s Gary Illyes began hinting about page speed being something that Google was looking at as part of the mobile friendly update. But Google has specifically been about on-page user experience issues thus far, including their most recent mobile friendly update last month. He also said that Google has been very transparent about everything with the mobile friendly update, so SEOs should expect to see something on Google’s webmaster blog when it happens. And if history is repeated, we will get at least a couple of months notice before before it becomes reality. This is also key because this would be the first time that something is included into the mobile friendly algo that isn’t strictly an on-page user experience issue, although page speed definitely plays a role in user experience. But how would Google factor this? Would it look at sites that are below a specific page speed metric on mobile? I asked for what page speed metric should SEOs aim for. John Mueller recently talked about page speed, and it negatively impacts sites that are slower, rather than giving boosts to sites that manage to incrementally improve their page speed. But if you haven’t concerned yourself with page speed yet, it is probably time to start considering your page speed, particularly on mobile. Google’s Page Speed Tool will also give advice and suggestions for reducing page speed, and is a great place to start for those who aren’t familiar with how to improve a site’s speed. Thank you for the update. Looking forward to reading all about the technical SEO side of building mobile sites with quick load times. I’m wondering why you don’t have social sharing buttons in your post? Assuming it might be some temporary bug.